but they still require close supervision by their healthcare team before they can return home. facilities which provide medical care in a safe area for complex patients. is approximately $2,500, in comparison to a hospital stay at approximately $6,300. when caring for a child 'almost ready to return home'. 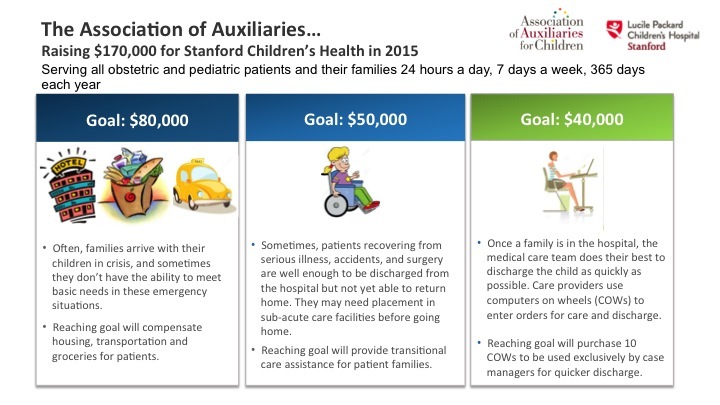 How many children/families are referred to Transitional Care annually? This transitional care assistance as described above is guesstimated by our case managers to be 4 patients/month – those patients who do not meet the criteria to go to any facility, thus not covered by insurance and yet cannot be discharged home. Would additional funding change this number? How much money for Transitional Care would be "too much"? What is the mean/average support from LPCH for a child in Transitional Care? We have had patients stay at the hospital from 1-90+days. In most of these cases insurance will not pay the stay at the hospital because the patient does not meet medical criteria, as such is ready to discharge. There are currently no funds to support this stay, thus for these cases the hospital would need to write off as bad debt. We can safely guesstimate about $10,000/night at the hospital (more or less depending on procedures, and acuity). What is the range of time that a child typically spends in Transitional Care? The average length of time the patient requires transitional care assistance will vary from patient to patient. Patient situations may be short-term or long-term, including palliative care. We may need a patient who needs at home medical teaching of some care management that can take 3 days of a home nurse going to do the education and approve appropriate management by the family at home, alternatively we have had instances where our patient may go home on 8/12/24 hour nursing for a year. What is the mean cost of a 24 hour stay at LPCH? What is the cost of a transitional care facility stay overall for the patient? The cost of transitional care assistance overall for the patient can vary depending upon the hours of care needed (e.g., 8, 12, or 24 hours/day). For instance, a skilled nursing facility can cost anywhere from $400-$500/day (low end) and provide 24 hour/day assistance. An LVN providing home nursing care can cost anywhere from $50-$70/day. For an 8 hour day, the cost would range from $400-$560/day. And, as Jody mentioned a transitional care facility can cost about $20,000/month, depending on care needed.